High Ash Camp was used between January and May 1944 by the 7th Armoured Division (the 'Desert Rats'). It is the only British training ground to be used by this Division. The northern part of the camp was used by the City of London Yeomanry. Concrete roads and foundations of huts and camp buildings are now displayed as a heritage trail. A World War Two Cromwell tank on a plinth near the road is a war memorial. A deep brick-lined well was found 'on High Ash Hill near to reservoir' in 1994. It has now been plated over and reburied. This may have been connected with the camp. 1998. Rapid earthwork identification survey. A large circular pit 30m in diameter was located at TL81089694 and was thought to be a former marl pit. S. Howard (HES), 2 September 2011. Site of army camp, used 1944 by Seventh Armoured Division ('Desert Rats') as their only training site in Britain; northern area used by City of London Yeomanry. Concrete roads remain, and also foundations of huts and various camp buildings. Now displayed as heritage trail; Cromwell tank mounted on plinth by road in southeast corner. Most of area now forested, pine and old hazel coppice. Report in 1994 by  of 46m (150 feet) deep brick lined well found 'on Highash Hill near to reservoir' plated over and reburied. This may be connected with the camp but may be just in Didlington parish and may be connected with the adjacent Falconers Lodge 18th/19th century (for this see NHER 34704). The reservoir was made in 1973. 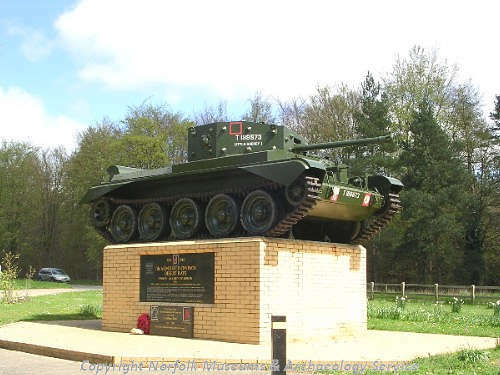 The Cromwell tank at the entrance to High Ash picnic site is a memorial to the 7th Armoured Division of the Desert Rats who were based here during World War II. The easy access trail passes through the old camp. Interpretation boards explain aspects of life for The Desert Rats during their stay in Thetford Forest during 1944. 1) Daily Routine in the Camp; 2) The Desert Rats; 3) Officer's Mess; 4) Cookhouse and Mess Hut; 5) Accommodation; 6) NAAFI; 7) The Cromwell Tank and Reme. D. Gurney (NLA), 23 November 2009. --- Photograph: Rose, E.. 2001. J2H 17 Desert Rats Memorial. --- Newspaper Article: Lynn News. 1998. 27 October. --- Newspaper Article: 1996. Eastern Daily Press. 8 April. --- Newspaper Article: 1997. Eastern Daily Press. 11 September. --- Newspaper Article: 1998. Eastern Daily Press. 8 October. --- Newspaper Article: 1998. Eastern Daily Press. 24 October. <S1> Unpublished Contractor Report: Pendleton, C. and Sommers, M. 1998. Rapid Earthwork Identification Survey for Forest Enterprise. Suffolk County Council Archaeological Service. 98/25.